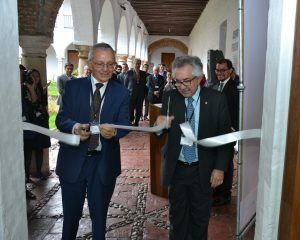 In a formal ceremony held on the 5th of December 2017 the Rector of the Universidad Nacional de Colombia, Ignacio Mantilla, and the Ambassador of Germany in Colombia, Michael Bock, celebrated the official inauguration of the office of the German-Colombian Peace Institute – CAPAZ, in the Claustro de San Agustin in Bogota. The German Ambassador in Colombia, Mr. Michael Bock (left) and the Rector of the Universidad Nacional de Colombia, Prof. Ignacio Mantilla (right), cut the ribbon in the official opening of the CAPAZ’ office. Photographer: Liodegar Martínez. The inauguration ceremony counted with the assistance of representatives from the German Embassy in Colombia, international cooperation agencies, Colombian government institutions, as well as non-government organizations, academics, researchers and journalists. Kai Ambos, professor of the University of Göttingen participated as representative of the German universities in the CAPAZ consortium. 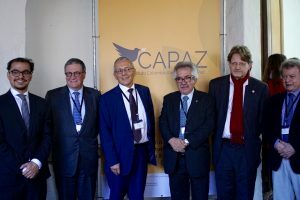 He recognized the important contribution of the German government delegate, Tom Koenigs, in the Colombian peace process by creating and consolidating the initial proposal of the CAPAZ Institute. Professor Ambos also emphasized the significance of working in and with the most affected regions by the conflict as it is projected by CAPAZ. The professor of the Universidad Nacional de Colombia and Colombian coordinator of the CAPAZ Consortium, Camilo Borrero, highlighted the importance of collaboration among the Colombian founding universities and the impact that this work has in the Colombian society. He emphasized the significance of the CAPAZ Institute in connecting institutions and researchers dedicated to peace-building and post-conflict studies. From left to right: Dr. Carlos Nupia, Manager of CAPAZ; Dr. Pablo Navas, Rector Uniandes; Mr. Michael Bock, German Ambassador in Colombia; Prof. Ignacio Mantilla, Rector U. Nacional; Prof. Dr. Kai Ambos, U. Göttingen; Prof. Alvaro Franco, Vicerector U. de Antioquia. Photographer: Ovidio Gonzalez. The manager of the CAPAZ Institute, Dr. Carlos Nupia, presented the projects and activities that CAPAZ executed during its first phase, the results of the academic cooperation between Colombia and Germany and the future activities of the Institute for 2018. The office of CAPAZ is located in the Claustro de San Agustin in Bogota, a building with a historical heritage which is managed by the Universidad Nacional de Colombia, one of the five founding Colombian universities of the CAPAZ consortium.